Star San is a self-foaming acid sanitizer ideal for brewing, dairy and other food and beverage equipment. It is an extremely effective bactericide and fungicide and is not affected by excessive organic soils. Star San also reduces water spotting and can be used without rinsing under the proper concentrations. STAR SAN is a blend of phosphoric acid and dodecylbenzenesulfonic acid. This synergistic blend provides a unique killing system that is unaffected by excessive organic soils. STAR SAN is also a self-foaming sanitizer. It can be applied through a foamed to produce self-adhering sanitizing foam for external sanitation. 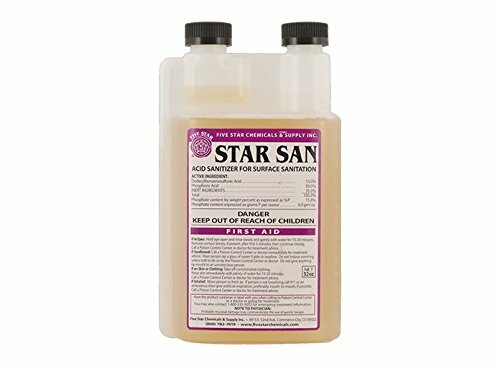 STAR SAN is also an excellent sanitizer for hand application. Sanitizing with STAR SAN on a daily basis will leave equipment in an acid condition that will eliminate water spotting. If you have any questions about this product by Star San, contact us by completing and submitting the form below. If you are looking for a specif part number, please include it with your message. Kombucha Brewing Kit with Organic Kombucha Scoby. Includes Glass Brew Jar, Organic Kombucha Loose Leaf Tea, Temperature Gauge, Organic Sugar and More!